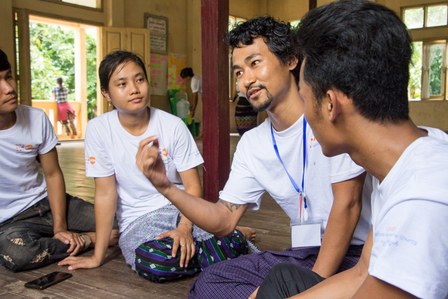 The youth camps are part of UNFPA’s work to give young people in Myanmar a stronger voice in the country’s peace process. 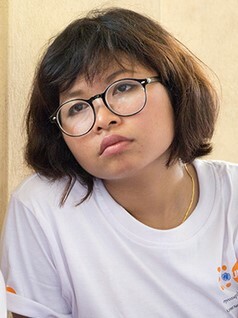 BAGO, Myanmar - “If young people are united, we can have greater participation in the peace-building process”, says 18-year-old Khun Htet Shar from Bago. He is one of over 1000 young people from across Myanmar who are participating in youth camps for peace, supported by UNFPA. Myanmar has been torn by internal armed conflicts for over 70 years. Hardest hit are border areas, where most of the country’s many ethnic minorities live. At a junction when Myanmar has begun a transition towards democracy, ceasefire agreements and peace conferences have failed to achieve lasting peace. Instead, several conflicts and crises around the country have escalated dramatically over the last year. The camp agenda focuses on building the confidence and the ability of young people to engage in civic affairs. A profound transformation is needed, and part of the force for positive social change can come from young people. It is the young women and men that can form a foundation for a sustainably inclusive and peaceful society. The future belongs to them. Yet young people have largely been excluded from efforts to resolve conflicts in the country. The youth camps are part of UNFPA’s work to give young women and men in Myanmar a stronger voice in the country’s peace process. The first youth camp for peace was held in Pyu in Bago, and saw more than 200 young women and men from different ethnic origins gather from 23-29 June, 2018. Another five camps are scheduled to take place in Kayah, Kayin, Magway, Rakhine and Shan. During their week in the camp, the participants receive support and guidance to unleash their energy and turn their aspirations into action. The agenda focuses on building the confidence and the ability of young people to engage in civic affairs. Through lectures on personal development, leadership, peace, and civic education, mixed with team-building activities such as story-telling, talent shows and debates, they learn how to become advocates for peace and agents of change in their own communities. The camps are designed to expand national multi-ethnic youth networks, and to strengthen coordination of the youth peace movement across diverse communities. To nurture the prerequisite tolerance, the camps have introduced a unique sessions where the young people put on cultural performances and discuss their cultural values with each other. “When young people from different parts of the country and of different ethnicity come together to share and understand our challenges and opportunities, then we can strengthen the relationship between diverse communities. This is what we are doing in the camp, and we are getting along just fine”, says 22-year old U Hla Htay from Rakhine, who participated in the Bago youth camp. “The older generation has to join hands with young people in peace-building process”, says 24-year-old Pan Ei Thazin. The youth camps foster the will and capacity of young women and men to contribute to peace-building in Myanmar. They also function as a counterpoint to youth dissolution, radicalization and violence, which has destabilized several countries and derailed their development in the 2010s. UNFPA’s work for the camps is guided by the UN Security Council Resolution 2250, which recognizes the positive role youth can play in conflict prevention, peace building, and prevention of violent extremism. “Programmes like this encourage unity among young people, expand our network, and help in reducing conflict. The older generation has to give us helping hand and also join hands with young people in peace-building process”, said 24-year-old Pan Ei Thazin from Mon at the Bago camp. The youth camps for peace are organized in partnership between UNFPA and civil society organizations Swethaha, Youth Circle and Genuine People’s Servants. UNFPA’s funding is supported by the United Nations Peacebuilding Fund.